The Sheboygan Rifle and Pistol Club is composed of the individuals who define and make up our community. In this light we feel it important to reach out to the outside world with our resources, especially when we can assist in education and safety. We realize and respect that not everyone has the same interests or beliefs, but do want to keep our proverbial door open, and our hand out to be a source of positive impact to our friends, coworkers and families. Quite a few individuals obtain education on various levels through our club, and often it is with an intent to have at least basic firearm safety knowledge as they may live in a home where firearms are kept. Others simply are interested because firearms are a part of the outside world and individuals want to make sure they and often their children know what to do to be safe around firearms should they encounter them. Each year on the first Saturday of June, the Wisconsin DNR hosts a “Free Fishing” weekend throughout the state. Licenses are not required, and, in our area, various clubs create an event held at Riverview Park in Sheboygan Falls where young people have the chance to try fishing, archery, canoeing and other outdoor activities free of charge. The Sheboygan Rifle and Pistol Club runs a B.B. gun range in a safe environment for young people to try out shooting activities as well. An introductory simple lesson is delivered from a DNR certified Hunter Education Instructor on basic firearms safety with a focus on what to do if a firearm is found in a home or elsewhere. While these young people may never hunt or shoot as adults, we hope to pass on this basic safety knowledge which may play an important part in their lives. As they leave, they have received basic safety knowledge and have had the opportunity to shoot a simple B.B. gun in a safe environment successfully. All safety equipment is provided and there is no cost. Our club has also hosted unique “one-off” shooting opportunities for church groups, community/civic groups, schools and other organizations who wish to have a few hour session of basic firearms education followed by an opportunity to safely try out firearms. Scout troops, clubs and anyone else interested are encouraged to contact us and we will make arrangements to meet the needs of your individual group to provide a great experience. We are not a business and if there are any expenses they would be kept at a minimum, but most hosted events are free as we hope to be a public resource. Firearms are chosen to meet the shooters ability and experience, allowing an unintimidating pain free experience. Our goal is to take what we know and share it with our community to keep our sport alive and promote safety in the general public. 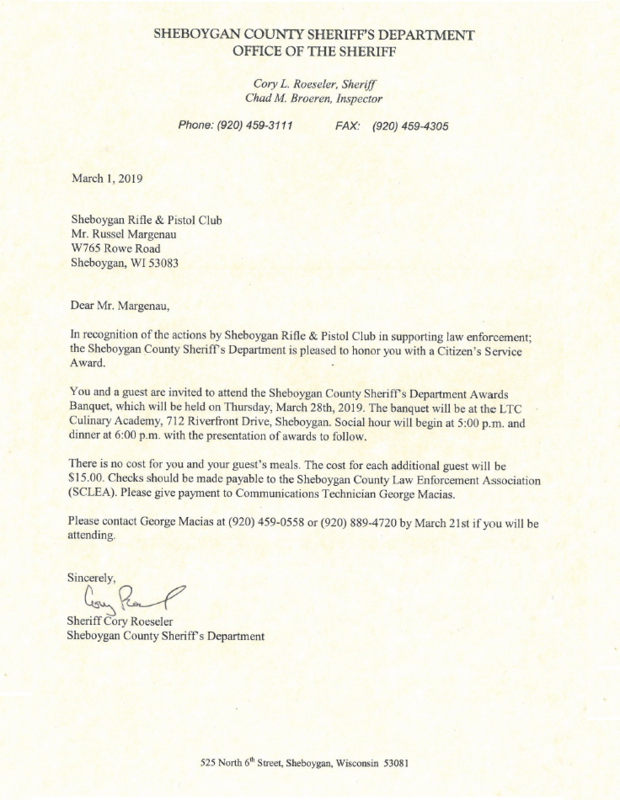 In March, our Club was just nominated by the Sheboygan County Sheriff's Department for a Citizen's Service Award!